This recipe for gluten free sugar cookies is one to add to your repertoire. Find those cookie cutters in the back of your cupboards, the ones you forgot you had or borrow some from friends. The thin edge of a cookie cutter is ideal but if you have none you can simply make round cookies with a clean, empty tin can. They’ll definitely taste the same. Keep your decorating simple or host a cookie decorating extravaganza making several colours of royal icing. (Read all about the tips and tools for icing in this post on How To Make Royal Icing.) It’s all up to you. Once I decided I wanted to learn more about baking gluten free cookies I set out to do that. Writing my year-long blog series on How To Use different gluten free flours inspired me to try new recipes and experiment as I learned. I share all those tips in this post, Tips For Making Gluten Free Cookies. This post contains affiliate links. When you purchase using these links your cost is the same, but we receive a few cents for every dollar spent. We greatly appreciate your support for this website. Rolled cookies are a bit fussy, you can’t just plop them on a cookie sheet and throw them in the oven. But rolling cookie dough is not difficult, even gluten free cookie dough, so consider hosting a cookie baking session with friends. Here are a few tips to ensure your efforts are successful. Sugar cookie dough is delicate and needs to be rolled out gently. Pat the dough into a ball and put it on a piece of waxed paper. Sprinkling the dough with a little flour prevents it from sticking to the rolling pin (I use tapioca starch or sweet rice flour). Flatten it into a disk with your hands then wrap the waxed paper around it. This is when it goes in the fridge to chill before rolling. Due to the amount of butter cookie dough is soft and chilling it makes it easier to handle and possible to roll thin. The timing isn’t precise, just use the chilling times as a guide and notice when the dough is too soft to work with. Back in the fridge and it will be fine. I always divide the dough into two pieces at the beginning so I can have one in the fridge while I’m working on the other. Yes, this is what that lesser used kitchen tool, the rolling pin, is designed for. To roll out dough always start at the center. Gently roll toward the edge being careful not to go right off the dough as this will make the edges too thin. When the dough is sticky sprinkle it with flour. I leave the dough on the waxed paper and start to roll it out. As you stretch the dough it becomes sticky. This is when I sprinkle flour on the dough, place a flexible baking mat on top (or more wax paper) and flip it over. Gently peel off the wax paper and sprinkle a bit of flour on the other side of the dough. Finish rolling to the desired thickness flipping a few more times if needed. When it is the right thickness cut out the shapes and transfer them to the baking sheet. Sugar cookies are the perfect cookie for decorating. You can add candy sprinkles before baking or you can spread them with icing. The decorating possibilities are endless if you are up for a serious decorating session. I love being inspired by kids but due to poor planning none were available at the time of my Valentine Sugar Cookie photo shoot. I couldn’t leave my Valentine cookies naked so I added a simple drizzle of chocolate and voila. Placed on some coloured tissue paper, or anything red or pink, you have a Valentine masterpiece. My other favourite method of serving or giving away cookies is putting them in clear cellophane bags tied with a beautiful ribbon. I think giving a little bag with just three or four cookies is a thoughtful gift that anyone would appreciate. I prefer clear bags so you can see the cookies and also because I can use them for giving year round. I think a Cookie Decorating Party is the perfect solution to all the holiday events that exclude the celiac population. 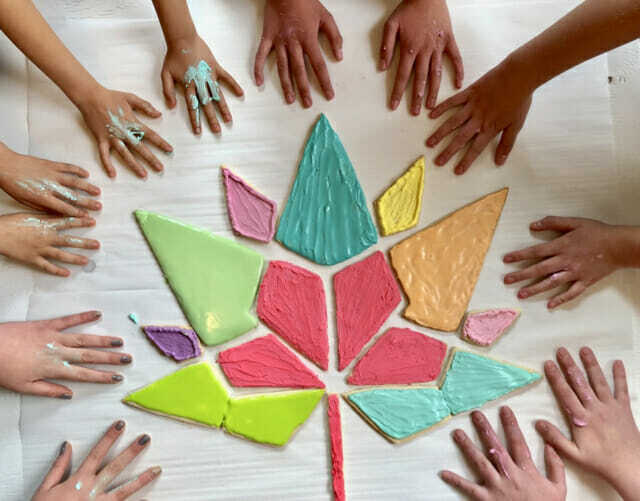 I wrote this post, How To Host a Cookie Decorating Party, after I hosted one with kids from our local Calgary Chapter of the Canadian Celiac Association. We made a giant Canada 150 flag and had lots of fun. Many of my pans are more than ten and twenty years old. It takes time to collect good quality pans but it is worth the effort in the long run. Pay attention to the pans and sizes that you like and work well for you. I suggest you work toward a collection like this so you can bake items like cookies, brownies, muffins, cupcakes and even the occasional cake if you want. Some of these pans can also be used for savoury dishes you make. Did you make sugar cookies? I’d love to hear about it in the comments below. Or you can post a photo and tag me on Instagram @everyday.GF.gourmet. In an electric mixer beat the butter and sugar until light and fluffy. Add egg yolk and vanilla, mix until combined. On low speed gradually add the dry mixture just until combined. Transfer the dough to a lightly floured surface and shape into a ball. Divide the dough in half onto 2 pieces of waxed paper. Flatten each one into a disk. Cover with the waxed paper and refrigerate for 30 minutes or overnight. Preheat oven to 350°F and prepare baking sheets. Gently roll out dough to ¼-inch thickness, sprinkling with flour as needed. TIP - Rolling the dough with waxed paper on both sides makes it easy to flip over. Gently peel off the paper and cut out shapes. Sprinkle with a bit of flour if dough is too sticky. Transfer cut cookies to baking sheets and refrigerate 10-15 minutes for best results. Gather remaining pieces of dough from cut cookies, gather into dough ball and repeat as before. Refrigerate dough 10-15 minutes before rolling out again. Bake cookies in preheated oven for 15 minutes or until just turning golden on the edges. Allow to cool on the baking sheet for 2-5 minutes before transferring to cooling racks. Cool completely before decorating. For maximum freshness - Double wrap and freeze cookies if not using within 1-2 days.